“Low and slow” is the mantra of barbecue-pit masters everywhere who recognize that gentle heat and long cooking times are the keys to succulent ribs, brisket, and other smoked meats. However, for those of us who don’t have a smoker (or the free time to babysit one all day), cooking your meats sous vide is a great substitute. Purists will argue whether the following should be called “barbecue,” but even the most ardent fundamentalists acknowledge that the results are astoundingly good. Why is sous vide such a powerful tool for barbecue? In a word: control. Transforming tough cuts, like ribs, so that they’re ready to fall off the bone requires melting the tough network of collagen fibers into gelatin. This process happens over time in the presence of heat and water, faster at higher temperatures and more slowly at low temperatures. Of course, cooking your meat at a higher temperature comes at a price: dryness. So barbecue experts painstakingly cook their meats over the indirect heat of wood fires, attending to their fires constantly to control the temperature of their smoking chamber. In a sous vide bath, the Sansaire maintains far more precise temperature control over the course of hours, or even days! The result is succulent cuts of meat that remain incredibly juicy and perfectly tender. The picture below is a close-up of a pork rib after 48 hours of cooking at 60°C / 140°F. Much of the collagen that binds together strands of muscle has melted away, allowing the meat to shred easily. 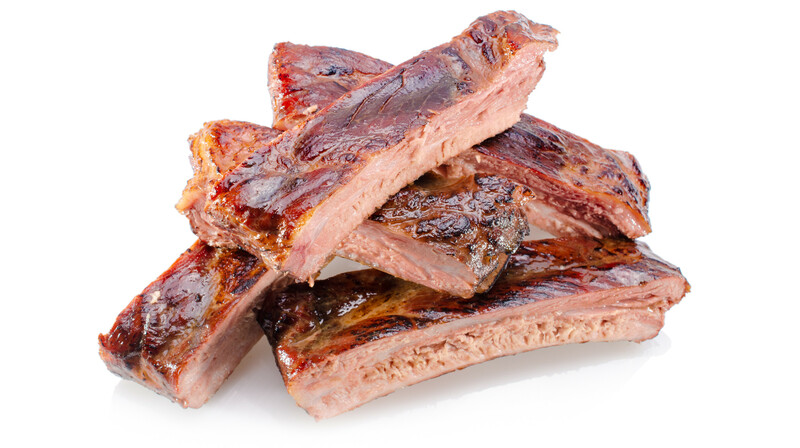 A trained eye will notice that the photos of these ribs do not show a smoke ring, one of the key indicators of traditional barbecue done well. Smoking adds incredible flavor to meats, and when done at low temperature, is actually a great pre-step before cooking the meat sous vide for tenderness. However, for those of us who don’t have access to a smoker (or for when the weather doesn’t cooperate), we find that you can still produce satisfying “barbecue” by sealing the right mix of ingredients with your meat. Our recipe below makes two interesting departures from a traditional barbecue sauce. The first is our attempt to establish regional “Seattle-style” barbecue by including a shot of espresso. This is definitely not a thing. . . yet, but it is delicious, and we’d be happy to see the movement take off. If you prefer, a shot of cold brew or other strong coffee will do the trick. The second unusual element to our barbecue sauce is the use of xanthan gum and gelatin. Xanthan gum is a naturally derived thickener that has recently become popular among gluten-free bakers. Used in combination, the tiny amount of xanthan and gelatin thickens the barbecue sauce and help emulsify the juices and rendered fat given off by the meat. You can leave these ingredients out and still thicken the drippings from the bag into a fine barbecue sauce, but they’ll give you a great head start. Preheat your water bath to 60°C / 140°F. If necessary, cut the rack of ribs into two segments of 5-7 ribs so that they’ll fit in your vacuum bags for the water bath setup. Combine the maple syrup, balsamic vinegar, Worcestershire sauce, liquid smoke, Tabasco, and coffee in a medium bowl. Optionally, for a thicker barbecue sauce directly from the bag, sprinkle the xanthan gum and gelatin into the bowl. Blend thoroughly with an immersion blender until the sauce has thickened and no lumps remain, about 2 minutes. Place the pork ribs into the vacuum bags. Divide the sauce among the bags, and seal. Due to the long cooking time, we recommend using a vacuum sealer for this recipe. Place the bagged ribs in the water bath, and cook for 48 hours. Remove the ribs, reserving the sauce and drippings that have accumulated in the bag. 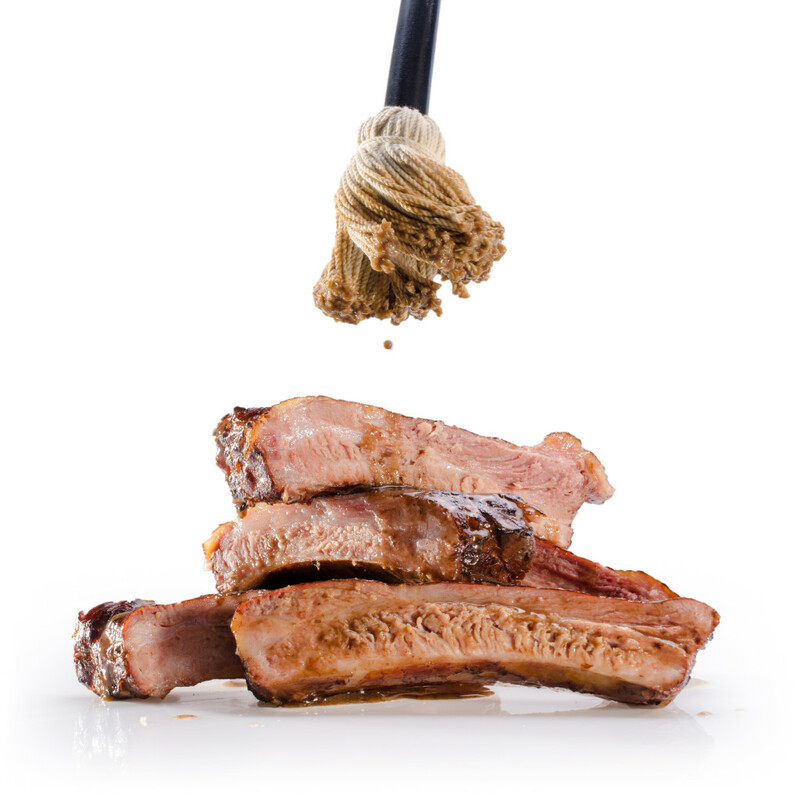 Pat the ribs dry, and sear both sides using a blowtorch, a grill, or the broiler in your oven. Optionally, for a thicker barbecue sauce, strain the sauce and drippings into a medium saucepan. Bring to a boil, stirring constantly, and cook until the sauce has thickened, about 2 minutes. Season the barbecue sauce to taste, and serve alongside the ribs. Of course, feel free to experiment with your own flavor combinations and regional variants. If you feel empowered by your new-found barbecue prowess, share your results with #Sansaire so that we can brag about you!